Preheat the oven to 400°. In a large bowl, combine the pork, beef, breadcrumbs, basil, cheese, eggs, and 1 teaspoon each of salt and pepper; mix well. Roll tablespoonfuls of the mixture between wet palms to form 30 meatballs. In a 9-by-13-inch ceramic baking dish, spread half of the pasta in an even layer. Arrange half of the meatballs and mozzarella over the pasta. Spoon half of the marinara sauce on top, and season with 1/2 teaspoon of salt. Repeat with the remaining pasta, meatballs, mozzarella, sauce, and 1/2 teaspoon of salt. Add 2 1/2 cups of water to the dish, and cover tightly with foil. Bake until the pasta is tender and most of the liquid is absorbed, about 1 hour. Uncover and bake for 5 more minutes. Turn on the broiler, and broil 8 inches from the heat until the top is lightly browned. 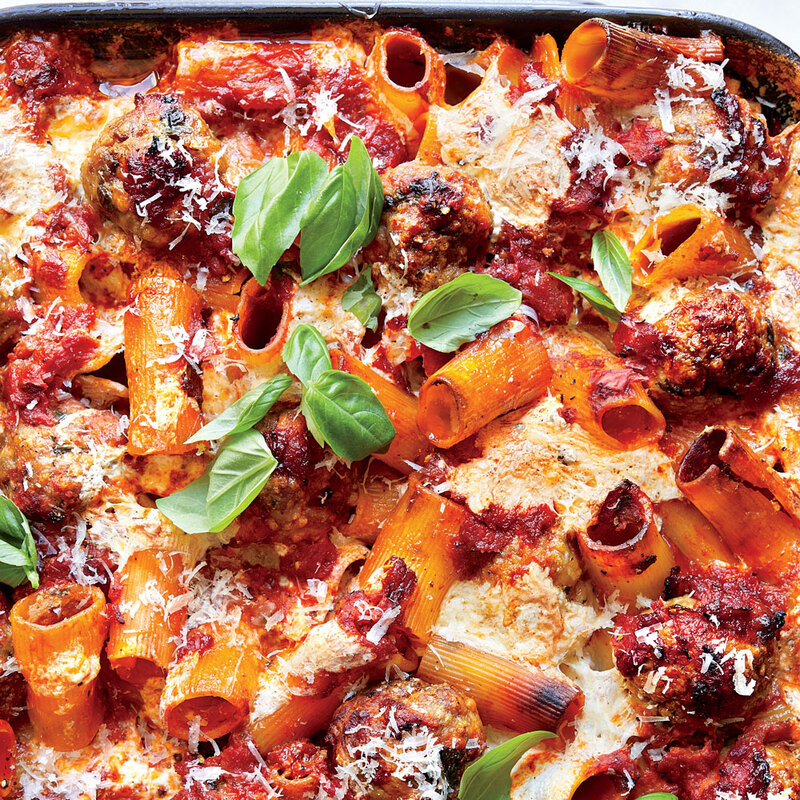 Let stand for 5 minutes, and then garnish the baked pasta with basil and cheese and serve. You can use other pasta shapes, such as longer, thinner ziti, curly rotini or fusilli, shells, or campanelle, which look like little bells. Review Body: Great recipe! Very easy to make and delicious dish. I followed it exactly as written and it turned out great. The final broiling at the end leaves nice little crunchy bits on the pasta on top...so good! It took me 20 minutes to prep and a little over an hour for the baking. Turned out great and I would definitely make it again. Review Body: I didn't have fresh basil so I used dried and I used Italian seasoned bread crumbs in place of plain crumbs. Excellent and easy.